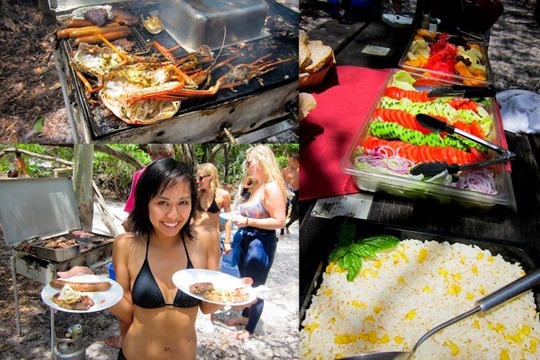 Beach, BBQ and Snorkeling. What better way to cruise the Whitsunday Islands? I know we’re in good hands when we’re a part of a small family run business. For us, it isn’t just about the location or sight-seeing – it’s the people that makes all the difference and is equally important, if not more, in making the experience enjoyable and memorable. 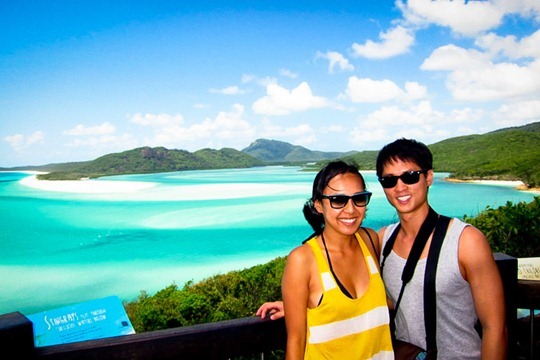 Such is the case when we decided to cruise the Whitsunday Islands with Whitehaven Xpress. 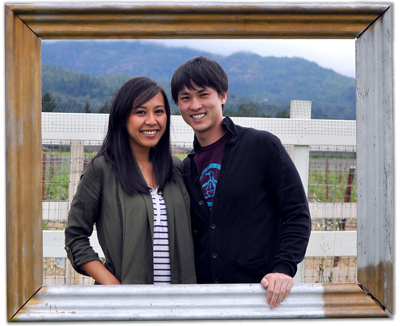 You’ll get to spend the day with Scotty, Dan and Asha – my half Vietnamese brother from another mother. LOL. Scotty’s full of jokes, Dan’s super chill and Asha’s like a kid in a candy store, anxious and excited – he’s a great character and makes the effort to get to know each and every passenger. The day starts with the standard safety briefings and a few signed papers. Get familiarize with where things are located like the toilet and top deck. The “bar” or cooler on board is stocked with drinks for a small fee. You pay at the end of the trip. Price is reasonable – water, chips and soft drinks are $2.50, beer is $5 and wine $6. No more than 40 or so people, the boats not that big which I appreciated. We’re not big fans of large groups. Pick-up: We didn’t arrange for pick-up. Instead, we walked from town along the waterfront which wraps and leads straight to the Marina. Tea, coffee & biscuits: Served not just when you get on board but is available throughout the day. Bushwalk: The hike to the viewing point is easy with minimal steps. About a 15-20 minute walk to Hill Inlet Scenic Lookout. View: It’s the view you’ve probably seen in pictures – crystal clear and pristine water and white sand beaches. It’s even better than pictures in my opinion. I didn’t think beaches could look so pure. Absolutely breath-taking. Beach: Whitehaven Xpress is the first boat to arrive on Whitehaven beach. We had the entire beach all to ourselves before any other tour companies arrived – that was awesome! Spent a good 30 minutes being beach bums before we were called for our BBQ lunch. Lunch: I was so pleased with the amount of food we had for lunch. We had steaks, hamburgers patties and hotdogs with grilled onions, fresh tomatoes, cucumber, and lettuce served with bread and rice with corn. And a ton of fresh fruits! Lunch also came with a bonus. Rock lobster isn’t part of the regular menu, but on this particular day, Captain Dan caught two giant ones so on the grill it went. So good! Once finished, we all packed up and headed back out to go snorkeling just as some of the larger tour companies were arriving. If snorkeling isn’t your thing, Whitehaven Xpress has a glass bottom boat which you can ride in and see all the colorful fishies under water! 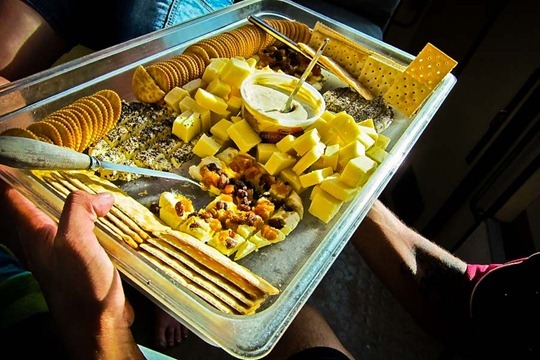 Cheese & Crackers: This was such a luxury. By the end of the day, we were all snorkeled out. Asha and Scott prepared a platter of an assortment of cheeses and crackers on our sail back to the Marina. It was seriously heaven. I kept sending Gerard back for more cubes of cheese but the platter was gone fast. Drop-off: We didn’t arrange for pick-up or drop-off but Jill was kind enough to take us into town and drop us off by our hostel. I had no idea what to expect booking a day tour of Whitsundays. 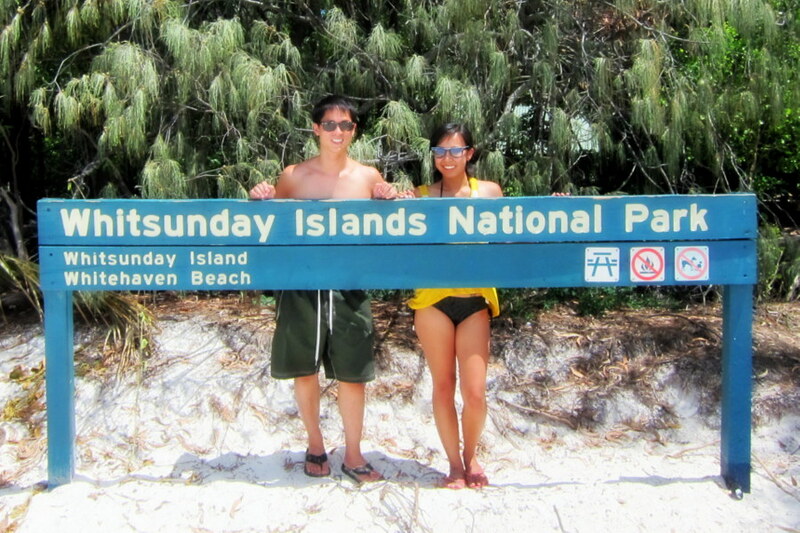 After our 3 day safari on Fraser Island, I wasn’t really up for extended tours of any kind. Most of the people we met said they were doing 2-3 day cruises so I thought we’d be missing out on something great. Turns out, we had a jam packed day highlighting the best of Whitsundays and I feel great about our decision to stick to just 1 day with Whitehaven Xpress. Have you cruised Whitsunday Islands? Share your experience in the comments! 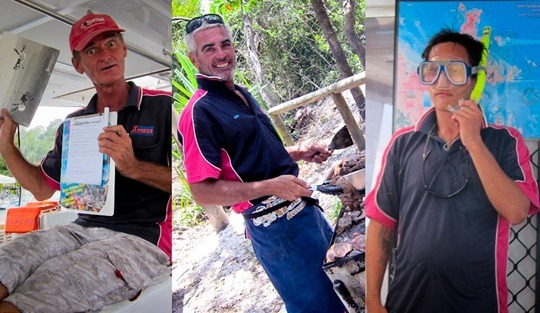 If you’re strapped for time and want the best way to cruise Whitsundays, consider booking a day trip with Whitehaven Xpress. Adult price is $150 / $75 AUD for child and includes pick up/ drop off, morning tea, coffee and biscuits, BBQ lunch and more. Stinger suits are available for $8 AUD which we highly recommend especially during peak jellyfish season. Disclaimer: We received a 2 for 1 complimentary cruise with Whitehaven Xpress. However, this review remains independent. My thoughts, my words. Still my voice behind the blog. Great day!…Love the pic with the fish! I did a 2d/2n cruise, mainly because I had the time. I really enjoyed my experience and felt like I picked the perfect boat and it had all the right activities (I went with a dive boat vs. a party boat). Glad you guys had a great time on your boat too!! oOo a dive boat! Now that sounds like fun! My wife and I did a 3-day Whitsunday sail back in 2008, and it remains one of my fondest travel memories. Small crew on a sailing boat, amazing food, and lots of good times. The captain also made sure we got some real sailing in, and there was many a day where we were practically tipped up and facing the water! These sure are some of the most beautiful beaches in the world. The sand is unbeliavable white. What do you think guys? Have you experienced more beutiful beaches on your travels? Okay this definitely looks like the perfect day – especially as it is 0C in Toronto right now! I love the Whitsunday Islands! I had so much fun sailing there when I was in Australia! It’s hard not to have a great time there huh?! Did you sail as part of a tour? 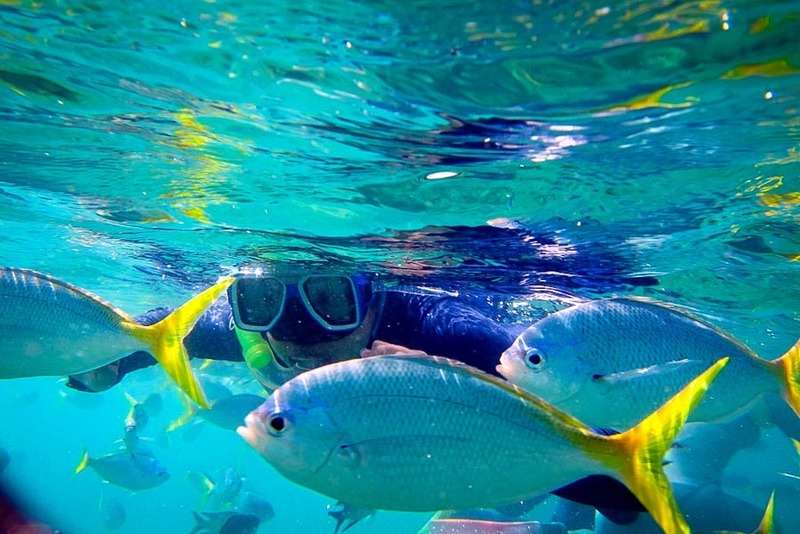 We are headed to the Whitsundays in May… We can’t wait to see all the islands, snorkel, and scuba dive!! Your pictures are amazing! It’s been fun tracking you two across your adventures!